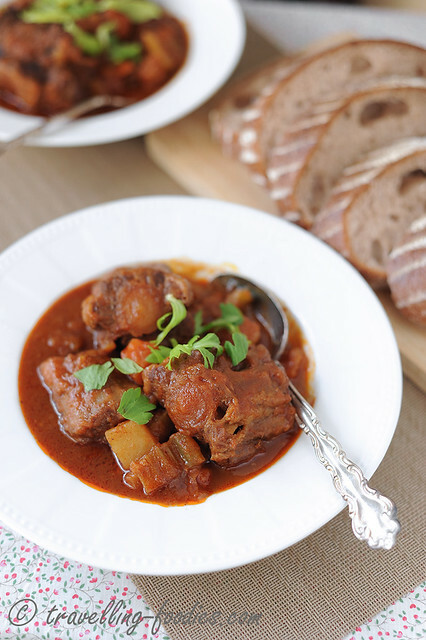 Gulyás or Hungarian Beef Goulash, as the name implies, originated from Hungary in Central-Eastern Europe and is a national dish there. 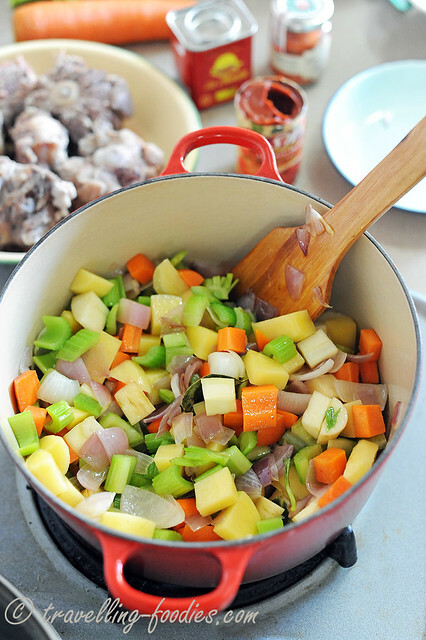 But its popularity extends to almost the entire continent, especially as a hearty dish in winter. The word “Gulyás” actually means herdmen who led a somewhat normadic life, driving cattle around looking for pastures. I guess the goulash would be one of the dishes they ate most often, if not invented. 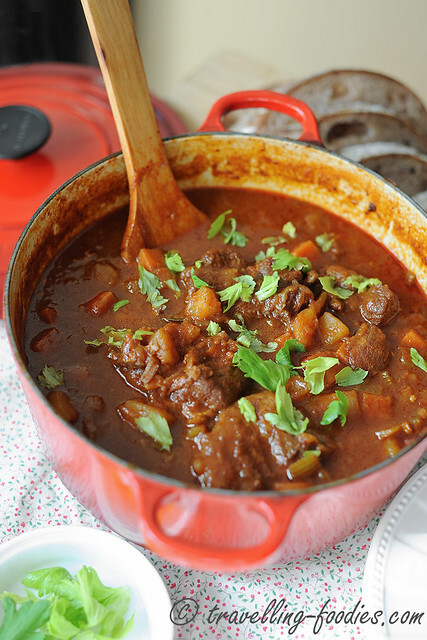 Goulash can also be cooked with pork or venison but the beef version is the most common. 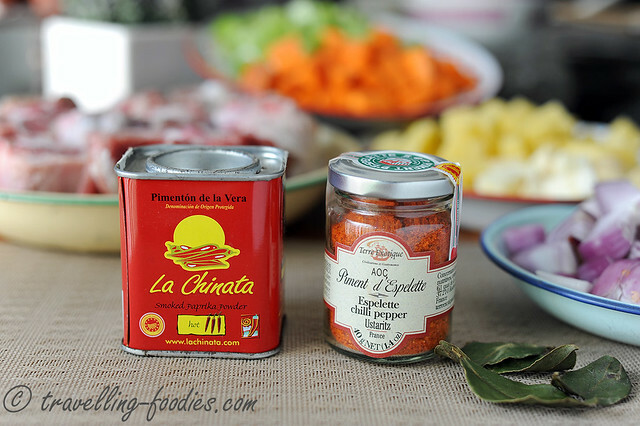 I don’t have Hungarian sweet paprika and used Spanish smoked paprika mixed with Piment d’ Espelette from France instead. The combination provides a mixture of sweetness and heat, but most importantly that lovely smoky flavours. Not sure if it is authentically Hungarian though… but it most definitely worked for me! 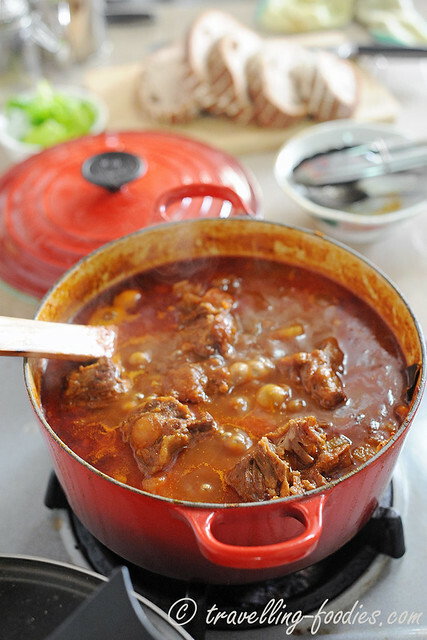 The process of cooking a goulash is quite no-brainer. 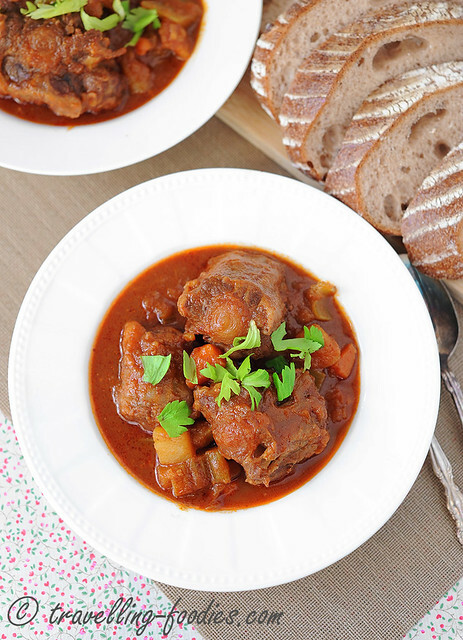 It is practically like any other beef stews. I’d cooked the oxtail first to remove any scum from the meat and most importantly, allow the fats to firm up so that they can be trimmed away easily. Next, I sweat the onions in a casserole (Le Creuset of course!) 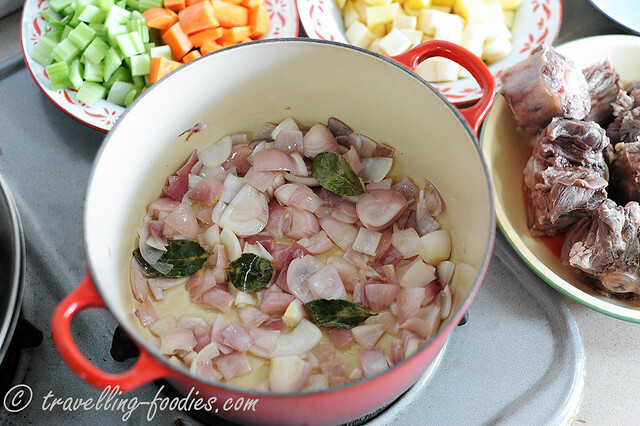 and added the garlic and bay leaves subsequently to work up the aroma. I’d used fresh bay leaves but I seriously don’t think they are better than the dried ones. Purely vanity sake if you ask me. In fact, the dried ones have a much stronger scent, in my humble opinion. Then in goes the root vegetables which had been chunked up previously. It is good to saute the vege cubes a bit. Duncha just love the colours!? To a pot of boiling water, add rinsed oxtail and cook for 10 min. 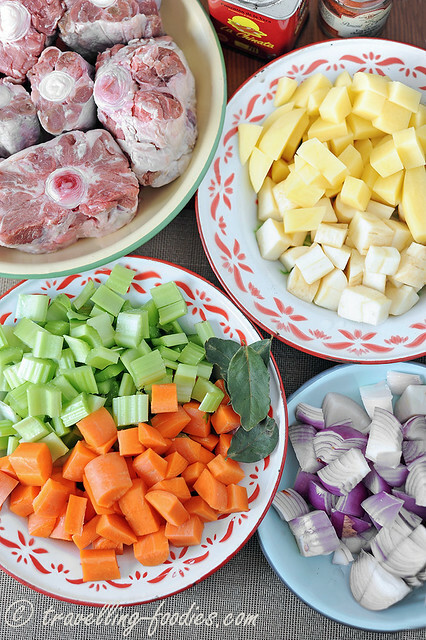 Drain oxtail and rinse again with water to remove scum, and trim off any excess fat. Discard blanching liquids. In a large casserole, add oil or butter. Saute and sweat the onions to soften. Add bay leaves and chopped garlic, and saute until aromatic. Add root vegetable cubes, and caraway seeds or allspice powder, and stir fry for 1 min or so. Add tomato puree, paprika powder and oxtail chunks, Mix well before adding water barely the ingredients are barely submerged. Mix well and bring everything to a boil. Lower flame to medium-low and simmer for 30 min. Season with sugar and salt. And continue to simmer for another 30 min or until the oxtail chunks are fork tender. Serve with csipetke, pasta or crusty bread. This entry was posted on September 2, 2014 by Alan (travellingfoodies). It was filed under Food, Simple Eats and was tagged with bay leaves, carrots, Hungarian Oxtail Goulash, onion, oxtail, paprika, parsley, parsnip, potatoes, tomato puree. Oxtail is my favourite cut also. 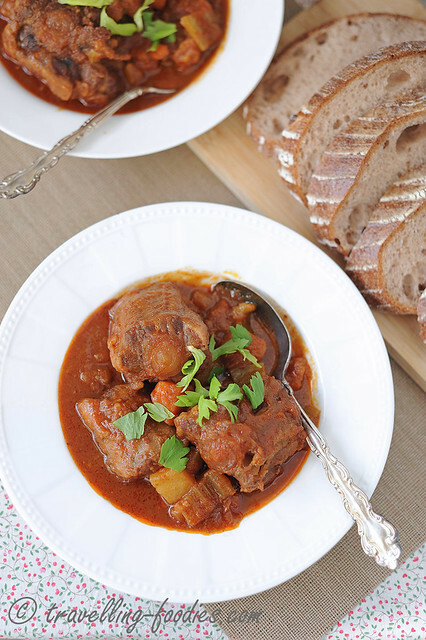 I have an oxtail soup recipe that tastes just like my Grandma’s. My kids can’t wait until I make it.